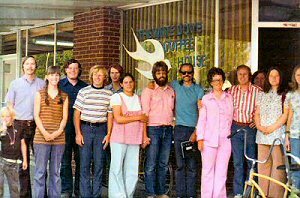 The Gathering Place Coffee House was started in 1969 by Jim Cox, an ex-convict who was miraculously delivered by the direct intervention of the Lord in a full-scale prison riot. Upon his release from prison and his subsequent commitment to the Lord, he felt a strong call to reach out to “hurting” youth living on the streets and those who were hitchhiking aimlessly across the country. Jim is currently in a writing ministry. Through poetry and short stories, he is recording his experiences and the Lord’s dealings with him during those years. 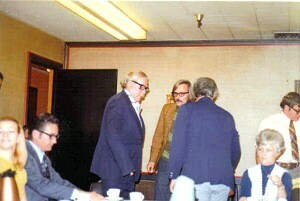 Examples of his writing may be found (on the internet) in the archives at Utmost Christian Writer’s Foundation, and on his personal blog at http://www.jimcee2005.blogspot.com. 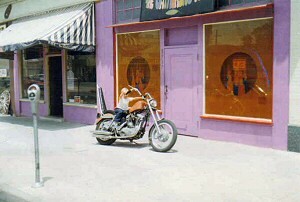 A small store-front building in downtown Riverside, California was used as a contact point for reaching the young people. 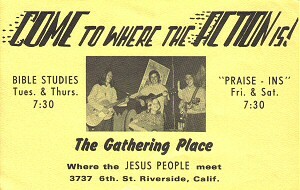 The Gathering Place was adjacent to the historic Mission Inn. It was a good location because there was lots of foot traffic in that area, and it was around the corner from one of the more popular nightclubs that appealed to young people. This was our business card. 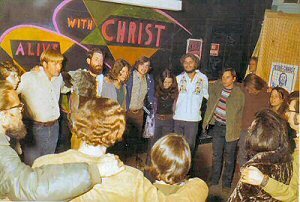 Jim and his staff used black lights, florescent paint, and day-glow Gospel posters to create a colorful environment that would appeal to the youth. 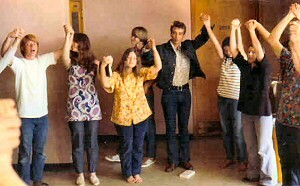 Bible studies for the staff and new converts were held on Tuesdays and Thursdays, and “praise-ins” occurred on Friday and Saturday nights. Love Song, Quo Vadis, Debbie Rettino, and other local contemporary Christian music groups with a “cutting-edge” sound ministered. 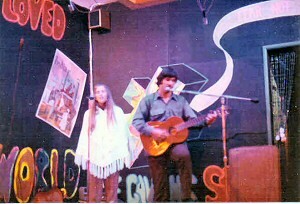 Jim and the Barefoot Gospel on tour at the White Dove Coffee House in Roswell, New Mexico. This was at night, after a daylight concert across the street at the Courthouse. All told, we ministered at a charismatic church, a Baptist church, a Catholic church, and were blessed to minister to a crowd of 8000 young people at New Mexico Military Institute. by 10 foot high screen with Jim standing at the right. square on each of the five screen. It was a very powerful evangelistic tool! 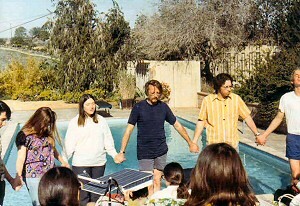 Jim’s vision for outreach to the troubled youth included more than just the local coffee house. He, along with other street ministers, constantly searched for more effective ways to communicate the Gospel in a contemporary form that would reach all people. Some aspects of this endeavor included a radio program that aired on the popular KBBL radio station. 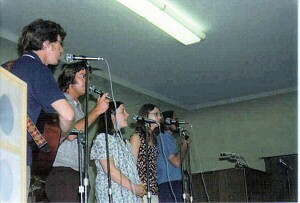 Another form of outreach involved a twelve-person band called the Barefoot Gospel. They played contemporary Gospel music. A large multimedia film presentation entitled “The Search,” depicted simultaneously on several giant screens, the contrast between man’s technological and scientific achievements, and the worsening human condition on our planet. 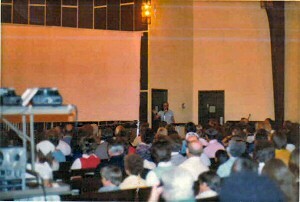 It employed 38 projectors, including sixteen millimeter film clips, special effects projectors, and slide projectors. They were “mixed,” and projected onto a fifty-foot long by ten-foot high screen. This presentation attracted a wide variety of people from every walk of life. This production was shown locally and on cross-country tours. These are the five first members of our Barefoot Gospel singing group. Seven more were added later for a total of twelve members. A brother and sister ministering in music at the Gathering Place on a Saturday night. The effect of the black lights is a dramatic rendering of the Cross in back of them. This is the "God Squad," a special of group of high school teens who really loved the Lord. They worked hard at being witnesses at their individual schools. 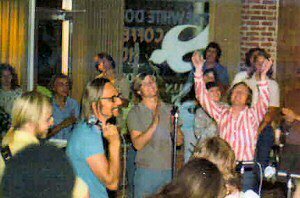 The coffee house closed its doors in 1979 as God moved Jim and his staff on to other areas of ministry.